Movement is essential to a mix. It can bring life to an otherwise dull track and can make or break a song. Get the upper hand with Mobius. 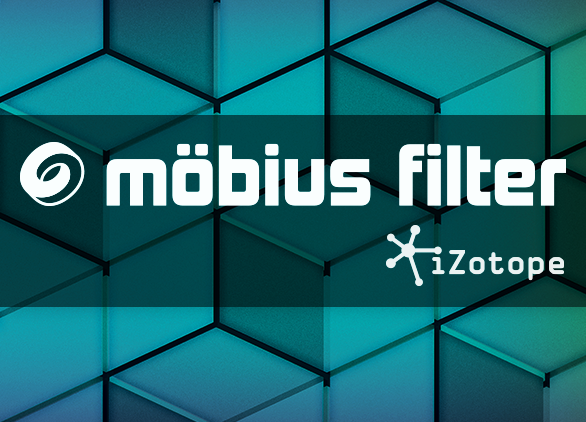 Cambridge, MA (March 29, 2015) – iZotope, Inc., makers of award-winning tools for audio production, is announcing the release of Mobius Filter, a new effect plug-in that creates the sensation of infinite movement. Based on the auditory illusion of the Shepard Tone, the filters within Mobius Filter appear to defy logic, producing perpetually rising or falling effects that can be easily manipulated with a playful X/Y pad. Add motion and energy to your music with infinitely ascending or descending filter sweeps. Draw your own sweeps with the X/Y pad, making fluid adjustments to both center frequency and resonance using a single control. Achieve a rapid, pulsing effect or slower motion by adjusting the host tempo sync to anything from eighth notes to eight bars. Create a static filter effect by pausing the filter motion with the Pause function. Or, pause it when it feels right and then automate it to create custom sweeps. Mobius Filter is available now for $49 USD (€49 EUR) at www.izotope.com and at select retailers.